The swollen Fraser River in Chilliwack, B.C., last week. The widespread flooding in British Columbia that has threatened communities from the Interior to the Vancouver region is the result of a worst-case scenario of a snowy winter followed by a hot, wet spring, experts say. And while very little can be done to prevent such flooding, they say this year’s floods underscore the need to better prepare for such natural disasters. 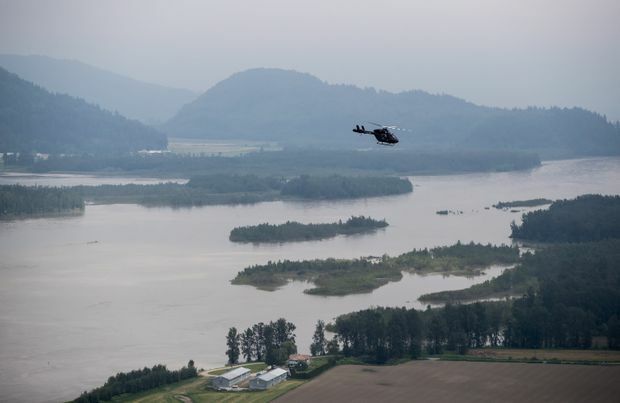 Thousands of people have been evacuated in the Southern Interior, while evacuation alerts have been issued along the Fraser River east of Vancouver. The high May temperatures have caused snow melt, or “freshet,” to travel from mountain peaks and into water systems earlier and more quickly than usual. “Everything is melting at once. Add a little rain on top and river systems can’t manage that,” said Ms. Lyle, who has spent more than two decades studying floods. On top of that, last year’s forest fires may have also created an environment that left the province more susceptible to flooding, she said. When the surface of the ground is burnt, soil becomes impervious to water, which means it can no longer absorb runoff. Instead, the top ground layer allows the water to flow into water systems. While emergency officials have described this year’s flood conditions as the worst in decades, Jeremy Venditti, the director of environmental science at Simon Fraser University, said what’s happening actually isn’t that unusual. What isn’t typical is the rate at which the snow is melting. Dr. Venditti said spring temperatures usually fluctuate, with hot periods broken up by chilly weather. This steady increase in temperatures usual leads to a gradual − and manageable − trickling of snow melt into river systems. He said the difference this year is that B.C. has seen a prolonged period of hot weather. Although high temperatures are to blame, Dr. Venditti urges people to exercise caution when making parallels between the current floods and climate change. Markus Schnorbus, the lead hydrologist at the Pacific Climate Impacts Consortium, also warned against reading too much into a single year of bad floods. Ms. Lyle, of Ebbwater Consulting, said policies need to be developed that will better prepare the province for future flooding. She said that “a whole spectrum of things” can be done to help British Columbians, including designing and developing buildings that can withstand flooding, ensuring resources are allocated to dike-system management and maintenance, and implementing evacuation and emergency-response systems. Ms. Lyle said she also believes that British Columbians need to reconsider their relationship to floodplains. Dr. Venditti of Simon Fraser University also pointed to floodplains as a problem. “Floodplains are called floodplains because they flood periodically,” he said, adding that the province should ban development on them. An independent report commissioned by the B.C. government also found that the province is under-prepared for major wildfire and flood emergencies. It offers more than 100 recommendations, including updated and proactive emergency-response strategies that foster improved preparedness. Jeremy Uppenborn, a senior public-affairs officer at the Ministry of Forest, Lands and Natural Resource Operations, said in an e-mail that the province is developing a flood-risk strategy that will be risk-based, as opposed to hazard-based. “It is expected that the strategy will include a review of the floodplain mapping model and make recommendations to incorporate risk and climate change,” he said. Residents brace for a second wave in flood-ravaged Southern Interior of B.C.